A pterygia is a pinguecula that has grown onto the cornea. Most pingueculas do not grow onto the cornea. Pinguecula and pterygia are cosmetic concerns and do not represent tumors. Pterygia are surgically removed if they get close to the center of the cornea. However, cosmetically they can be significant concern and are frequently removed for cosmetic reasons. Since both of these are more common in people that life by the equator, exposure to sunlight is thought to be a major risk factor in their development. Exposure to dust and wind are probably also risk factors. Wearing sunglasses and lubricating the eyes with artificial tears, not visine, may slow their progression and make them less noticeable. Surgically, pterygia are easily removed from the cornea and the sclera since they are attached superficially. The primary risk of surgery has been the chance of recurrence after removal. They can grow back even more aggressively than they were initially. Recent techniques involving a rotational graft or anti-metabolites have reduced the incidence of regrowth after removal. Concretions are collections of calcium in the conjunctiva. (The conjunctiva is the skin lining the inside of the eyelids and the outside of the eyeball, forming a sac). 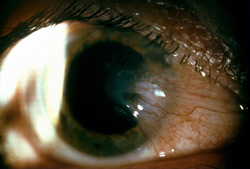 They become symptomatic when they erode through the conjunctival surface, typically in the upper eyelid, and rub against your cornea each time you blink. They are usually few in number but I have seen cases where 50-75 concretions formed a continuous line along the upper tarsal border of the upper lid. A symptomatic concretion will eventually have the conjunctiva regrow over it with the symptoms going away, although the concretion can be de-roofed again. Concretions are not related to high blood calcium levels.